Beginning with version 3.5.5, three add-ins, Face Extractor, Face Locator and Face Mixer, were added to the FantaMorph Deluxe edition. With these intelligent, powerful and novel tools, morphing faces or fusing multiple faces into one has never been easier and faster! With Face Extractor, the program can automatically extract the face portion from an image. 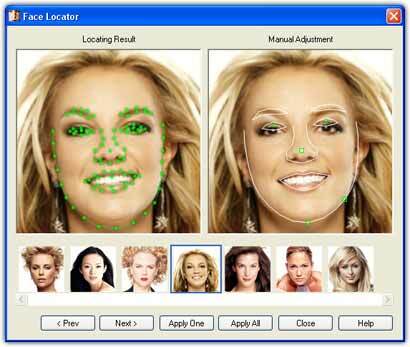 With Face Locator, the program can now automatically detect the facial features (eyes, nose, mouth, etc.) and place key dots on appropriate positions, this will extremely save your time. With Face Mixer, you can mix two or more pictures into one. In most cases, we use Face Mixer to compose a virtual face with multiple real faces. For example, we have a series of images as shown below. We will show you how it is easy to morph multiple faces or compose a virtual face with multiple real faces by using FantaMorph Deluxe. In most cases, the picture size and aspect ratio of the source images are very different, and you will find that you only wish to work with the face portion of the images and don't wish to use entire images. Although you can use the built-in crop tool (see "How to Crop Source Images") to select the desired face portion of an image, it is not an easy work. Especially after you change the movie size, you have to re-crop all the source images to keep the aspect ratio, otherwise the movie will be distorted. Now, with the intelligent tool, Face Extractor, the program can automatically extract the face portion from all the source images in the project using an extracting template. See more about "How to Use Face Extractor". After using Face Extractor, all the cropped source images are in the same aspect ratio, and all the extracted face portions are aligned. This will ensure the final morph very smooth. Now, the most important element is to place key dots on all the source images in order to define how the morphing or composing process will operate. But, we all are tired of placing key dots one by one manually... With the intelligent tool, Face Locator, the program can automatically detect the facial features (eyes, nose, mouth, etc.) and place key dots on appropriate positions. This will extremely save your time! See more about "How to Use Face Locator". After using Face Locator, the morph result is almost good. You can then spend a little time to modify the key dots accurately or add more key dots for a better result. Any way, with Face Extractor, placing key dots on a face of an image has never been easier and faster! Especially, after you change the final movie size, just launch Face Extractor again, it will automatically re-crop all the source images to fit the new aspect ratio. With Face Mixer, you can easily mix multiple pictures into one. In most cases, we use Face Mixer to compose a virtual face with multiple real faces. See more about "How to Use Face Mixer". Can you imagine what a virtual face we will get? See below. Yes, it's virtual, but it looks strikingly life-like, as a real person. It is none the person in any source image, but it is really influenced by each person in the source images. By default, we get an "average" face of the source faces as above. Face Mixer can also create countless results by using random percentage of the source faces. See below. Please try to fuse different pictures of your favorite stars, your friends and family, men, women, children or any people into a wonderful, awesome or funny face. It's just plain fun! Beginning with version 4.0, the following advanced features were added to the Deluxe edition. New Morphing Control Tool: Camera - Now you can pan/zoom/rotate each morphing frame through a customized curve. This tool makes it possible to set a moving camera viewpoint to see the morphing process. You'll find that you can easily create very different and amazing morphs than ever before. You can also create a simple pan/zoom/rotate animation with Camera for one photo. New Morphing Control Tool: Track Curve - Now you can use a real curve as morph track instead of previous straight lines. You'll find that you can easily create very different and amazing morphs than ever before. New Add-in: Face Library - With this new add-in, you can easily collect and store source images along with key dots in a classified library. You can then drag some objects from the library to create a new morph or face composite when needed. Intelligent Memory Management - Using this intelligent memory management technique makes it possible to load unlimited or huge source images in one project. Sequence Effect - Now you can create the add-on effects (background, mask, foreground, etc.) not only for the whole movie, but also for each sequence. You can also set the intensity or transparency for each effect. Import/Export FMD File - Now you can export key dots on an source image separately to a .fmd file and then import it into another source image when needed. You can also use your own program to generate the .fmd data file for source images without having to manually place key dots in FantaMorph. Export Morphing Frame to FME/FMD - Now you can export a morphing frame to FME or FMD file. This makes it possible to use the intermediate morphing result as source images in other projects. Export 32-bit AVI - Now you can export a 32-bit morph with alpha channel to a 32-bit AVI file directly. You can then import the 32-bit AVI into video editing software as a overlay video. Morphing Server - FantaMorph can now work as a morphing server. You can easily integrate FantaMorph into your own application. Only available if you purchase FantaMorph Deluxe Site License.